In any occupation, there are elements that are not as “fun” as other elements of that occupation. As a result, many people will often procrastinate and slow themselves down in an effort to “avoid” those boring or tedious elements that they don’t like doing as much as the fun aspects of their job or occupation. In truth, those efforts to procrastinate, make excuses, and just avoid certain aspects of an occupation or task just lead to people taking longer to complete work they could do much quicker, leading to them getting less done than they could within a set amount of time. Additionally, it forces them to work harder, take more time away from other activities they’d rather be doing, and can lead them to doing poorer-quality work because they have to work faster to make up for the time they lost by procrastinating and making excuses. Due to the fact they are working faster, they’re more prone to making mistakes and not thinking clearly when doing important tasks. Procrastination is just one excuse people make when they want to avoid a more unpleasant part of their occupation or a project or task they are not particularly fond of doing. However, procrastination isn’t the only challenge people face when people try to get high-quality work completed in a set period of time. Often, people will question If they can work fast and still deliver high-quality work. They will often doubt themselves over whether they are doing something properly or if it’s what their target market, boss, or customer is looking for in the completed work. As a result, they slow down and take longer to complete the work when it’s usually not necessary. Time management is key for everyone, but especially for entrepreneurs who are their own bosses. Entrepreneurs must motivate themselves to stay on or ahead of schedule; there is no boss who will get on them to stay on or ahead of schedule. If an entrepreneur falls behind an intended schedule, only he/she can motivate himself/herself to pick up the pace and get back on track. He/She won’t lose his/her job, but also won’t get as much to any profit because he/she is failing to do the work expected of him/her in a set period of time. Entrepreneurs in particular have to learn to not let distractions take away from their focus when doing work for clients and/or for their businesses. Time is the one commodity you cannot get back, and each distraction that takes work time away from the entrepreneur costs him/her money, reputation, and time doing other things, both within the business and away from the business. Some distractions are the type that can be controlled by the entrepreneur, such as being logged into his/her social media accounts. Other distractions are the type that can’t be easily controlled by the entrepreneur, such as kids running around the house, etc. Both types need to be managed if an entrepreneur is going to overcome the excuse of not getting as much done as he/she can within a specific period of time. Another important aspect of time management entrepreneurs must learn is being efficient in their work time so that they can take breaks, enjoy themselves, and not burn themselves out trying to complete projects and other tasks necessary to have a thriving business. Oftentimes, entrepreneurs will want to work every waking minute of every waking hour, sacrificing their health, well-being, and social life just to improve their businesses. Yet, taking this approach can actually hinder an entrepreneur from improving his/her business. Therefore, dealing with procrastination, self-doubt, and distractions is key to overcoming excuses and getting the most high-quality work done in the least amount of time possible. In order for entrepreneurs and others to do this successfully, they need to learn techniques and ways to counter the procrastination, self-doubt, and distractions they will experience as they attempt to complete projects and tasks that will boost their businesses, reputations, and profit. They also need to learn how to manage their time so that they are efficient, do the best-quality work in the least amount of time possible, and not ignore other areas of their life that would endanger their health, well-being, and their businesses. 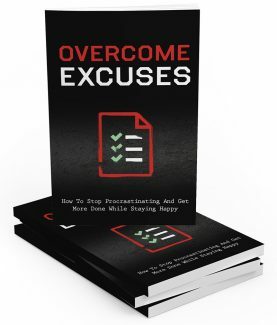 In the coming chapters of this book, you will learn why procrastination is a major enemy to doing your best work and why it is in your best interest to overcome it. You will learn how selfdoubt leads to slower work, which can negatively impact the quality of your work. You will learn how to handle both the distractions you can and cannot control so that they do not impact the quality or your work nor the time it takes you to complete them. You will learn why staying on or ahead of schedule is key to doing your best work. You will learn how to “make a game” out of getting things done promptly so you can work more efficiently. You will learn why focusing on the benefits and rewards you’ll get after completing a project is key to completing that project efficiently and doing your best work. You will learn why taking regular breaks during your project and taking care of your health and well-being are also key to doing your best work. Makes You Work Slower In virtually every occupation, there are certain aspects to a job or task that people don’t like doing. In the business or financial world, it could be that you have to work with mathematics or mathematical computer programs in order to determine what actions to take to create the best products for your business or pick the best stocks for your investment firm. In teaching, it could be writing or typing out the lesson plans you have to create for each day and week you teach. For entrepreneurs, it could be creating the sales letters you need to sell your online products. In essence, it’s the tedious tasks that every occupation has that most people try to avoid, even though in truth, there is no real way to avoid these tasks. They just “come with the territory,” as many people like to say. Yet, many people will try to avoid these tasks by procrastinating, taking longer to complete other tasks they like doing better in order to “avoid” doing the tasks that they don’t. For instance, in the business and financial worlds, much research has to be done in order to learn what is the next best move for one’s business or investment firm. Thus, people may like to access and read the various stories and reports online detailing what is going on in the world in order to know what is the next best move for one’s business or financial firm. They’ll spend more time doing the research than is necessary to do it well in order to avoid using the mathematical programs to analyze that research and determine what truly is the next best move for their business or financial firm. Similarly, there are those in the education field who prefer interacting with their students and giving them hands-on learning. As a result, some may try to avoid outlining their lesson plans by providing more hands-on learning and even spending time after school to provide tutoring for those who need additional hands-on learning. Some entrepreneurs may want to add more content to their products in an effort to make their products better and enable them to charge higher prices for them. As a result, these entrepreneurs will avoid creating their sales letters and focus more on making their products better. As you can see in the examples above, procrastination can sometimes be difficult to spot because one will think he/she is doing a good thing by focusing on a specific task that is needed for his/her business to do well. While all necessary tasks are important and need to have the appropriate amount of time spent on them in order for them to be done well, spending too much time on one area to cut back on time spent in another area because that first area is more enjoyable will likely lead to the business not performing as well as it should because not enough time and focus is placed on that second, less enjoyable area. What you need to realize when it comes to procrastination is that doing this will cause you to work slower than is necessary in order to achieve your best work. When you focus on a more enjoyable area of your occupation and spend more time doing that work, you are still only completing a part of the project or overall task you need to complete for your business to be doing as well as you expect it to. This takes more time away from the area of the business or occupation you are not as fond of, which will either lead to you not putting as much time on that area, leading to poorer-quality work that negatively impacts the whole project, or it will cause you to put in the necessary time and delay the completion of the entire project. In either case, you are slowing yourself down to avoid doing the work that is needed in that less-desirable area of your business or occupation. This is doing a disservice to yourself and to the business at large because you could be doing more in the same amount of time it is taking you to complete the necessary work. As a result, you could be getting projects done quicker if you were not procrastinating and avoiding the area of the business or occupation you are not as fond of. Your business could be doing much better as a result of you working more efficiently. Additionally, you could have more free time to work on other areas of your business or even to take time away to enjoy leisurely activities. Therefore, realize that procrastination does not help you or your business in any way. The work you keep “avoiding” will still have to be done in order for your business to function and succeed as you expect it to. All you’re doing by procrastinating is allowing yourself less time to complete that less desirable work you don’t like doing, likely leading to poorer quality that could harm your business. Or, you’ll give yourself more time to complete that less desirable work, which will lead to you missing deadlines and goals you’ve set to make up for your procrastination, which will also damage your business and keep it from thriving as you expect it to. Referring to the aforementioned examples, a business or financial person still has to use the mathematical programs to analyze gathered research in order to make the best use of it to benefit one’s business or financial firm. A teacher still has to make out lesson plans in order to best educate his/her students so that they progress and become contributing members of society. An entrepreneur still has to create sales letters to sell his/her own products. These tasks can’t be avoided to be a successful business/financial person, teacher, or entrepreneur. Procrastination of certain tasks will only lead to you doing slower work and doing less work in a set amount of time. Chances are high that you will also do poorer-quality work as a result. In the next chapter, you’ll learn that procrastination also makes you work harder to complete the tasks you need to complete in order to be successful.